How cute are these? 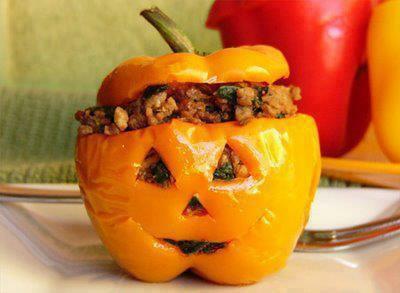 If you should happen to make stuffed peppers this month, give it a Halloween twist! Here’s the recipe for Pampered Chef’s(r) Italian Stuffed Peppers! So yummy and quickly made in the Deep Covered Baker in the microwave in less than 30 minutes! 1. Combine rice with 1/2 cup boiling water; let stand 5 minutes. Add onions, pressed garlic, seasoning mix, salt, pepper and 3/4 cup of marinara sauce; mix well. Break sausage into small pieces into a bowl. Add beef and 1 cup of cheese; mix gently but thoroughly. 2. Cut tops off of bell peppers; remove stems and seeds. Pierce bottoms of peppers several times with tip of utility knife. Place peppers cut-side up in deep covered baker. Divide meat mixture evenly into peppers. Microwave, covered, on high 15-18 minutes or until internal temp of meat mixture in each pepper is 160 degrees. 3. Carefully remove baker from microwave. Divide remaining sauce evenly over tops of peppers. Cover; microwave 1-2 minutes or until sauce is hot. Top with remaining cheese. Let stand, covered, 10 minutes or until cheese is melted.Remove peppers from baker using tongs; allow excess liquid to drain from peppers. This entry was posted in Recipes - Main Meals and tagged Cook, deep covered baker, dinner, Fruit and Vegetable, Halloween, Italian Stuffed Peppers, Pampered Chef, Pepper by tiannafonz. Bookmark the permalink. That is so cleaver to do with a stuffed pepper. I will have to remember that.